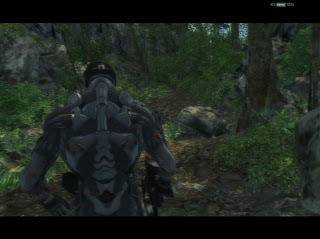 Crysis is the most advanced game I've ever played (so far). Graphics are stunning, although I have to say that it requires a powerful machine to run. 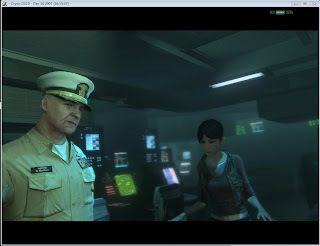 Even on my machine with good features, the ending still runs slow with the lowest settings. Gameplay is great and every weapon has customization options. According to the developers, the whole environment is 3D. That is, even the distant mountains are 3d models, not Bitmaps. Folliage looks great too and trees can be destroyed with the weapons available. One nice features is the ability to hide beneath the bushes. Some people rather prefer direct fighting with enemies, but I love the ambush! Being invisible is a good option inside the game. You can walk undiscovered by using the Invisible tool but even with that, enemies will suspect there's something around there. Finally, I have to note that characters are very detailed, you can even see the wrinkles on the face of this man. Check out the above screenshot.